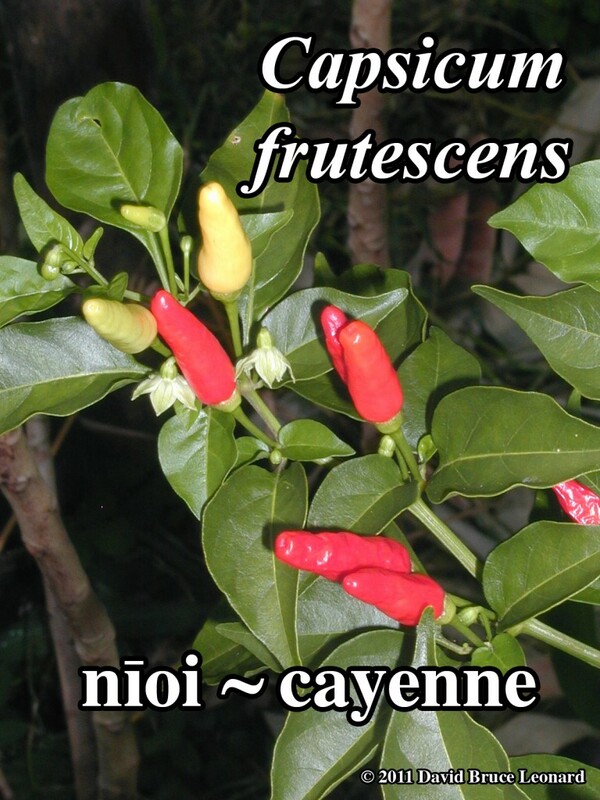 COMMON NAMES: Nïoi [Hawai’i]; cayenne, paprika, sweet pepper, tabasco pepper, red bird pepper, africa pepper, cockspur pepper, goat’s pepper [English]; aji, chile [Panama, Peru]; caja, kapur, rocoto [Cuna (Panama)]; cayennepfeffer [Germany]; hupo’o, ‘upo’o [Marquesas]; ic [Ancient Mayans]; khursani [Nepal]; la jiao, zhi tian jiao [China]; locoto [Quechua]; marichi-phalam (“pepper of the sun”) [Sanskrit]; mpilipili [Swahili]; oporo [Tahiti]; peberfrugt [Sweden]; pimentao, locoto, aji picante [Spanish]; pimente de cayenne, poivre de guienee [France]; polo feu [Samoa]; polo fifisi [Tonga]; polo mangiho [Niue]; uchu [Quechua]; vavalagi [Fiji]; waik’a [Aymara]. MERIDIAN AFFINITIES: Liver, Lungs, Stomach. The leaves have been used as a potherb. Please note: While Capsicum leaf has been used traditionally as food, I would not eat it until more research is done regarding its toxicity. The leaf and stem are reported to be uterine stimulants [Farnsworth 1975]. The fruits or leaves are used as antidote to poisonous fish [Africa]. Added to food to keep it from spoiling [Native American]. Used to “cleanse” in diets high in animal products [American Hippie Medicine]. The international consumption of Capsicum ranges from 2.5g / person / day in India, 5.0g / person / day in Thailand, and up to 20g / person / day in Mexico. Sprinkled in socks to keep the feet warm. Smoke from burning chillis has reportedly been used in torture. Indians in San Bas drag hot peppers behind their boats as shark repellents. Burned to drive off rats (both rodents and the human type). Also sprinkled in a garden to keep away feral pigs: One snoutful and they move on. Quickly. HABITAT: Nïoi grows on the dry leeward coastal areas of the islands, often a welcome friend living among unfriendly Kiawe trees. • Chronic toxic doses have caused eye abnormalities in lab animals due to substance P’s reduction of pain and corneal protective reflexes [Agarwal 1985]. This appears to be unrelated to blood levels of vitamin A. • Capsaicinoids in toxic doses cause hypotension, respiratory failure, and bradycardia [Monsereenusorn 1982]. See Cautions and Contraindications below. GATHERING: Don’t touch your eyes. Overdose produces vomiting, purging, stomach pain, giddiness, and intoxication [Eclectics] and can cause chronic gastritis, hypothermia, kidney damage, and liver damage [Gruenwald 1998]. Overdose is a rare occurrence if one uses common sense, but common sense may be uncommon. Caution in hypoglycemia, liver disorders, kidney disorders, irritable bowel, and hemorrhoids [Kowalchik 1987]. High doses may cause gastroenteritis. While counter-intuitive, it is sometimes used under professional supervision for gastric or duodenal ulcers [Kang 1995; Yeoh 1995], although Michael Moore reports it as not appropriate for active inflammation. Capsaicin inhibits H. pylori in vitro, but not E. coli [Jones 1997]. It is not known if metabolites of Capsicum are secreted in breast milk. Topical use can cause dermatitis and blistering. Don’t get it in your eyes: Trust me on this…. With mounds of conflicting data [Surh 1995(b), 1996, 1998], the jury is still out regarding the relationship of Capsicum spp. to various forms of cancer. The bad news is that there are many studies linking nïoi to specific cancers [Surh 1996]. Correlations to specific cancers include liver cancer [Agrawal 1986, Jang 1998], stomach cancer [Lopez-Carrillo 1994, Kim 1985], and oral cancers [Notani 1987]. Different organs may have different responses to nïoi [Jang 1991]. There are data implicating Capsicum with chromosome breaks [Richeux 1999, Singh 2001], but these may only occur at high doses [Richeux 2000]. The good news is that there is significant research demonstrating Capsicum’s anti-tumor activity [Han 2001; Surh 1995(b), 1996, 1998 & 2000; Park 1997, & 2004; Kim 2004].